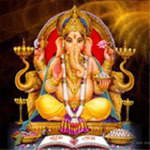 Sri Ganapathy Homam is said to be the greatest and chief amongst all of the other Homams. Generally, this Ganapathy homam is done as the startup of all the other homams. For instance, if Navagraha homam or any other homam is done for the betterment of life or to solve any other purpose, we should perform "Ganapathy Homam" first and then followed by other homams. This great Sri Ganapathy Homam can be done for all-purpose and our first offer or dedication should be for him only. And the reason for doing this homam is that all the other following things should be completed without any distraction and any obstacle in between.